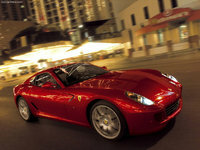 Start a new Ferrari 599 GTB Fiorano question. 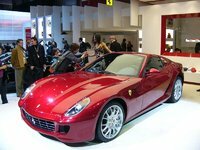 The 599 GTB Fiorano has been called one of the greatest Ferrari road cars ever - until the next model arrives. Sculpted by Pininfarina and the wind tunnel, the 599 is drop-dead gorgeous. And the engineering can only be described as drop-dead amazing. The heart and soul of any Italian automobile has to be its engine. 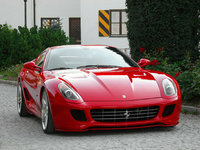 The 599 has inherited the fabulous Enzo supercar's V12. The 6.0-liter has evolved from the Enzo into the 599's all-aluminum V12 that makes 612 hp at 7,600 rpm with an 8,400 redline. And yes, the short-stroked V12 sounds like a Formula 1 racer when it soars toward those lofty rpm levels. With a 6.1-pound/hp weight-to power ratio, reviewers verified 3.3 seconds to 60 and 11.2 seconds at 131 mph covering a quarter mile. Ferrari claims the 599 tops out at about 205 mph. The optional $18,550 carbon-ceramic brakes will rein all of this in, with 70 mph to a stop accomplished in 148 feet, nine less than an Audi R8. Power transmits through another engineering wonder - the F1-SuperFast six-speed transmission. This clutch pedal-less transmission incorporates an electronic clutch and shifts at electronic speed. In its most aggressive mode, the F1-SuperFast transmission can wing off shifts in 100 milliseconds (0.1 second) - current Formula 1 racecars shift in about 50 milliseconds. Put in the appropriate "mode," the 599 will launch without wheel spin to pick off those amazing acceleration numbers. The 599's semiactive suspension glues it to the road when those twelve cylinders begin to sing. Combining a front and rear forged-aluminum double-wishbone suspension with magneto-rheological dampers (first time for Ferrari) - similar to the system in some Corvettes - the system reacts four times faster to road dynamics than traditional oil-based dampening systems. Reviewers unanimously report handling that matches any sports car with a lack of the harshness associated with shorter-wheelbased two-seaters. 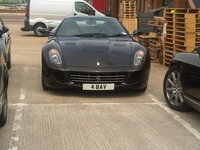 Yet the roomy and impeccably finished 599 drives like a daily driver. The Ferrari 599 GTB Fiorano makes grown reviewers wring their hands with consternation as to how to raise a quarter of a million dollars to possess one. It's really that good.